William Blake. Auguries of Innocence. Aidan and Jenny, with their daughter Melangell, have come to the remote pilgrimage shrine of Pennant Melangell in the Welsh mountains. Jenny is dying of cancer. But the peace and spiritual healing they seek is shattered by a murder. Tensions flare among the small community at the House of the Hare and the residents of this hitherto peaceful valley. Even Jenny is not above suspicion. But soon it seems that she herself may be in danger. Aidan desperately tries to save his family. Places are tremendously important to me. I was first inspired to write by a love of certain places in the West Country. I thought about the stories that might have happened there. Over the years, through my writing, I have developed a deep love of and interest in the Celtic Church. More than anything, it is these sacred sites which speak to me – the “thin places”, where the spiritual and physical worlds are only a hairsbreadth apart. One such place is the tiny village of Pennant Melangell, among the northern Welsh hills. 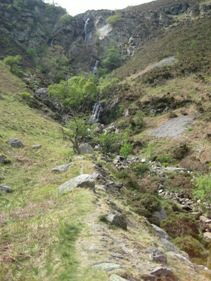 The road runs out just past the church of St Melangell, before the waterfall of Pistyll Blaen-y-Cwm. The churchyard is surrounded by giant yew trees, some 2000 years old. Time has hollowed their mighty trunks into fantastic shapes. Inside the church, a carving over the rood screen tells the story of the saint and the hare. Melangell was an Irish princess who fled to Wales to escape a forced marriage. One day, Prince Brochwel Ysgithrog came hunting in this valley. His hounds pursued a hare, then checked suddenly and refused to go further. The prince found the hare sheltering in the folds of Melangell’s skirt. He first proposed marriage to her, then when she refused, he gave her land in the valley to found a monastery. From then on, hunting hares was forbidden in this valley. Before the altar stands the stone-canopied shrine of the saint. It became a site of pilgrimage and a place of healing. It was destroyed at the Reformation, and its stones scattered through the parish. Later, what could be found was pieced together and the missing stones replaced. Today, it is heaped with prayer cards, from those who have visited to pray for a loved one or to give thanks. In the cobbled apse beyond the altar, there is a rough grave slab. Excavations found some bones from a burial. 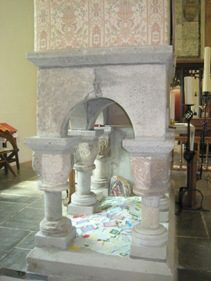 It is almost certainly the original grave of the saint, before her body was moved to the shrine in the chancel. When I first visited this valley, I was struck by the deep sense of peace that lay over the meadows before the church. Before I knew anything of its history, I felt the sense of healing. When I came to write the book, things fell together that I hadn’t planned. There is often a wonderful sense of serendipity about these things. 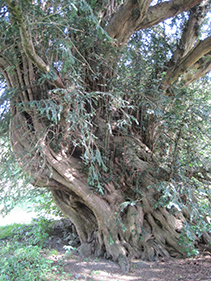 I had Jenny dying of cancer, but I hadn’t known in advance that yew trees are the source of a drug used to treat ovarian cancer. Archery features strongly in the book. It was a happy coincidence that yew is the traditional wood for bows. They turned to face the high cascade. One, two, and then three torrents came leaping down from the rim. They could hear the pounding of the falls. This was the force that gave birth to the placid river they had seen gliding through the pastures around the church. Aidan led the way across a tiny field to a gap in a stone wall. He came face to face with a running figure. Her ragged panting was close to sobs. The tumbling black hair could not hide the fact that the heart-shaped face was streaked with tears. Brilliant blue eyes went from father to daughter. Aidan was staring into the distraught face of Lorna Brown. “Sorry!” she gasped. She tried to hurry past. She flinched away from his touch. Fear flared in her eyes. She backed away from him, then turned and fled. She was not running up the hillside, but along the stream towards Pennant Melangell. Aidan watched her go, uneasily. Belatedly, without the beauty of her ravaged face to distract him, he noticed that her white shirt hung unevenly off one shoulder. His memory showed him the image of a button torn from the fine cloth. He looked up the last stretch of path to the waterfall. No one seemed to be following her. Yet they had seen two figures from above. He listened, but could hear no sound above the rushing falls. What, or whom, was Lorna running away from? What had happened in this seclueded spot?